Dr. Payne attended the University of Louisville School of Medicine before completing a residency at Baptist Hospital. He was in the Army Reserves for 12 years before moving to Nashville, Tennessee, and ultimately to Murfreesboro. Interacting and building relationships with families over the years has been one of the most rewarding aspects of Dr. Payne’s career. 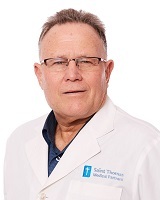 He now practices at Saint Thomas Health-New Salem in Murfreesboro. Outside of work, Dr. Payne enjoys gardening, travelling and spending time with his family.